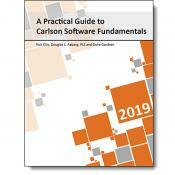 A Practical Guide to Carlson Software Fundamentals 2019 features 80 exercises organized into 34 lessons in 6 chapters. Each lesson includes detailed descriptions of processes and theory with many illustrations and diagrams, to help you understand “why”, not just “how”. A Practical Guide to Carlson Survey 2019 features 83 exercises organized into 37 lessons in 7 chapters. 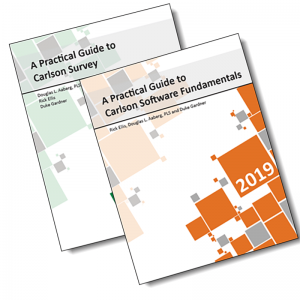 Each lesson includes detailed descriptions of processes and theory with many illustrations and diagrams, to help you understand “why”, not just “how”. This new Carlson 2019 books focuses on effectively using this powerful software, providing you with skills that other professionals are using in the workplace every day.